On June 22nd, there was an attempt to assassinate Margarita Martin de las Nieves and Santiago Ponce, widow and brother of Manuel Ponce Rosas (executed extrajudicially in February 2009). Both are indigenous peoples and members of Organizacion para el Futuro del Pueblo Mixteco (Organization for the Future of the Mixteco People or OFPM). They were stopped while on their way from the Office of Trachinollan in Ayutla to Margarita’s residence, after holding meetings with Fondo Para la No Violencia (Funds for Non-Violence) and with functionaries of the US and Canadian Embassies where they testified about the threats they have suffered and also about the extra-judicial execution of Rual Lucas Lucia and Manuel Ponce Rosas, whose cases remain unpunished. The Centro de Derechos Humanos de la Montaña Tlachinollan (Center of Human Rights of the Montaña Tlachinollan) condoned the assassination attempt against the indigenous advocates and requested that the Mexican State implement without delay security and protection measures, according to what is dictated by the Inter-american Human Rights Court. 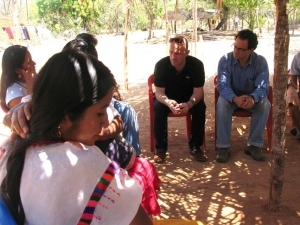 It is important to remember that on April 9, the Interamerican Human Rights Court (Corte) gave provisional measures to 107 human rights advocates from Guerrero, most of them indigenous people, by considering that their physical integrity is in grave danger.